From fishing to marketing, Sturia caviar is meticulously selected grain by grain and tasted at every stage of the production process. During caviar production, we sort grains according to extremely precise size, colour, firmness and organoleptic quality criteria. This method enables us to create uniform batches of outstanding quality. The 'gems' we detect in this way are offered to you in our amazingly clear-grained Oscietra Grand Cru selection, which has the same grain size as our Prestige selection. After production, caviar is packaged in original 1 kg tins and matured in our maturation rooms. After a few weeks' maturation for Primeur caviar, or a few months for the Vintage and Origin selections, it is tasted again and then packaged in smaller tins to grace tables throughout the world. As a result of this huge range, Sturia has become the 'haute-couture' caviar. 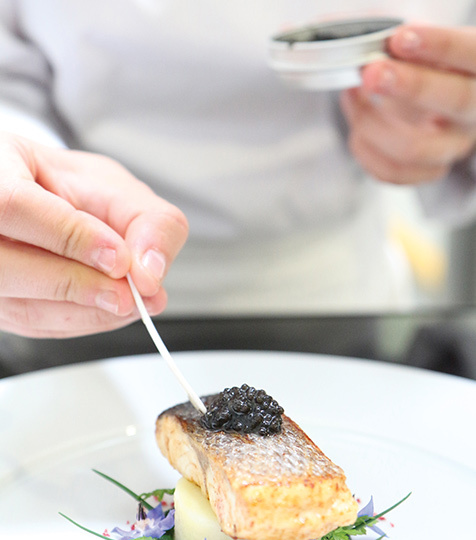 From fresh, newly caught caviar to powerful mature caviar, and from the clear eggs of our Grand Chef selection to the complex flavours of our Oscietra caviar, there's a Sturia caviar selection for everyone. This variety, which goes hand-in-hand with creativity, has won us recognition from the world's greatest chefs.